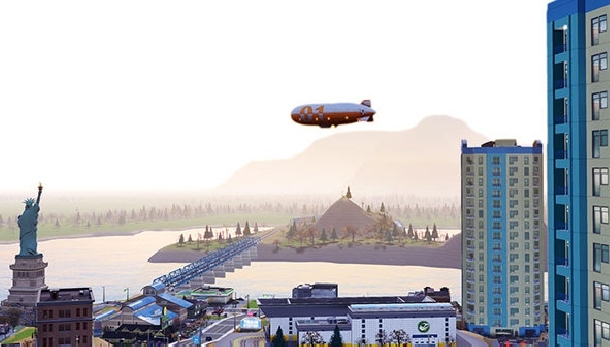 Hey there, blimpy boy: SimCity hasn’t gotten any more consumer friendly with its latest bit of paid DLC, but it has taken to the skies by adding airships, balloons and even blimps. Which, erm, is almost as good. Pretend you’re in charge of the bad universe from Fringe by shelling out $8.99 over on Origin (alternatively, you could just hire John Noble to stand glowering around in your house). Things what you’ll get as part of the download: ‘Airship Hangers’ for manhandling tourists, ‘Commuter Airship Mooring’ for taking care of commuters, a couple of hot air balloon parks and ‘Event Blimps’ that appear during, well, events. If for some reason you need a four-minute video explanation of the above, here is a four-minute video explanation of the above.